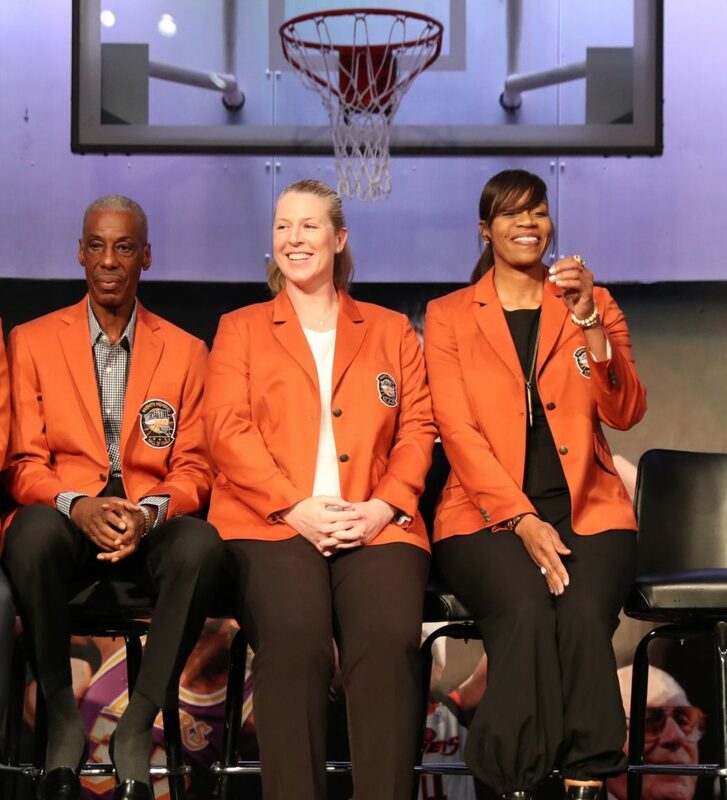 A pair of women’s basketball luminaries took their places among the all-time greats of the game in Springfield, Massachusetts as Tina Thompson and Katie Smith were enshrined as part of the 2018 class of the Naismith Memorial Basketball Hall of Fame. Thompson was part of the nucleus of the WNBA’s first-ever dynasty as she won four championships with the Houston Comets. She also went on to win a pair of Olympic gold medals after a collegiate career with the University of Southern California. She was also previously the WNBA’s all-time scorer before her record was broken last year by Diana Taurasi. Katie Smith became the all-time leading scorer in Big Ten history and led her Ohio State Buckeyes to an NCAA championship game as a freshman. Smith’s WNBA career included two championships with the Detroit Shock and her international resume includes three Olympic gold medals in 2000 at Sydney, 2004 at Athens, and 2008 in Beijing. Both have gone on to coaching careers. Thompson, after a stint in Texas, recently accepted a position as head coach at Virginia. Smith, after years as an assistant under Bill Laimbeer, is fresh off her first season as head coach of the New York Liberty. Of course, we at Beyond The W were on hand in Springfield to take in the sights and sounds. Thompson began her remarks with mentioning that her two presenters – Magic Johnson and Cheryl Miller were unable to attend. She gave praise to her eldest brother – Tommy – for planting the seeds of her passion for basketball. Thompson mentioned how she never felt ‘unsafe’ because of the skills he instilled in her to succeed on and off of the court. I am thankful for the many hours – days that you and Dave, Coach Fizdale, allowed me to enter your safe space. I grew because your experiences and your examples. She then reeled off a list of names – including Al Birdsong, Danny Walker, Daniel Stewart, and James Posey – as influential in her development. Thompson made sure to highlight that her rise to where she got to was anything but a solo act. I am a product of a village. Never could I have gotten here alone. She told the story of how her first coach allowed her to step foot on the court and that her first shot was a game-winner. Thompson then thanked her coaches over the years – including Reggie Williams, Frank Scott, Cheryl Miller, Fred Williams, Van Chancellor, and Brian Agler. Thompson thanked USC for also providing her with life skills needed to thrive on and off the court. It was truly a blessing to play at home and in front of my family and friends. She also highlighted her family and how it helps her remain humble given the task of balancing out a basketball career with personal obligations. I still have to cook and clean. No days off. Another person who took very little days off was Carroll Dawson, the former general manager in Houston. She thanked him for watching hours of film and making Thompson the first-ever top overall pick in WNBA history. You are one of the best minds I have ever witnessed. And not just because you chose me. I appreciate you for taking the time to teach me the very moves that you taught Dream. Although they didn’t look the same, they were very effective and I made a career out of it. I love you, CD. Two other figures that were instrumental behind the scenes in the Comets’ dynasty were Brett Johnson and Melvin Hunt. I appreciate the overtime that both of you spent with me, allowing me to pick your brains, investing in me the knowledge that both of you have. For loving me, my career is an example of that investment. Thank you. Thompson went on to thank the WNBA and plenty of the notables that were instrumental in its success over the years. She also thanked the fans as well USA Basketball for having the opportunity to play for two gold medal-winning teams. I am thankful for my Nike family. I am a Swoosh lifer. You all allowed me to compete at optimal levels throughout my entire career. There is no other brand like you. Also not left out were who Thompson referred to as the ‘unsung heroes,’ which included the medical staff at Houston’s Memorial Hermann Hospital. Of course, Thompson played among some talented teammates, including Sheryl Swoopes and Cynthia Cooper. She also had stellar representation on the business side, which included agents Jerome Stanley and Stephanie Stanley. Thompson gave them recognition as well along with her family and friends that did or did not make it to Springfield to hear her speech. A few family members that did make it sat on the front row as she spoke. Thompson made sure to give thanks to her mother and father as well as her son. She finished by shouting out those within basketball as well as the Hall itself for ensuring the festivities were a memorable experience. To my classmates, such a talented, high-character – and when I say high-character — I mean high-character group of people, I am honored and we will forever be connected. I close with Wahoowa and fight on. Smith was flanked by another notable current women’s basketball coach in Dawn Staley, currently head coach at South Carolina and USA Basketball. Dawn, I do want to thank you for coming up tonight and supporting me this evening. We’ve battled together and against each other over the years and I just have a tremendous amount of respect for her on and off the court. She also mentioned how wants to look to Staley as a “mentor” as a coach. Smith talked about how when she got the call from the Hall of Fame that she made it, she was in Columbus helping to put together what turned out to be an unforgettable Women’s Final Four. When mentioning how she felt at the moment, Smith could only think of one word. Or more specifically, four letters. Smith talked about how the Buckeye State made her into who she is currently along with spending her offseasons in Ohio. Her foray into the game began in the fifth grade in Logan, Ohio where her mother convinced the local coach that she could hold her own on an all-boys team. She became attached to the game from the athleticism to the physicality to the mental aspect. Smith played for an AAU team traveled across Ohio before Logan High School. Smith mentioned how her high school coaches – Jim Myers and Ralph Taylor had different coaching styles. Myers was into the X’s and O’s while Taylor, she says, was a master motivator. What she particularly took from those experiences were the lifelong friendships she made with her teammates in addition to praising local teachers for instilling positive values in young people. At OSU, she led the Buckeyes to the Final Four as a freshman, and remembered her teammates from her Ohio State days. Smith thanked Ohio State for its support as well as its athletic directors when she was there – including Jim Jones and Andy Geiger. Among those highlights were playing in the ABL, WNBA, and Olympics. Smith admitted she dreamt of participating in the Olympics, but never thought she would pursue hoops as a career. When she was finished at Ohio State, she had two pro women’s basketball organizations waiting on her. Upon entering the ABL, she got the chance to stay local and play for the Columbus Quest, where she won two more championships. Then came the WNBA, which she says continues to be of “central importance” and referred to the W as “the finest women’s basketball on the planet.” Smith thanked those – including David Stern and Val Ackerman – who were instrumental in getting the league up and running. Smith highlighted those in Minnesota and Detroit where she played much of her career and thanked her teammates and coaches there as well – as well as those on the Olympic teams. The investment she referred to was that in her story and her journey. Smith mentioned Isaiah Thomas and the New York Liberty for giving her the chance to be a head coach. She also praised the investments that came from her family. There was also a second “I” – injuries, which gave Smith the opportunity to give special thanks to the medical staffs she has worked with over the years. Speaking of which, Smith thanked the game for giving her the chance to travel the world. Basketball, Smith said, also gave her the chance to make lifelong friendships. She also mentioned her latest opportunity which came through her ascent to the head coaching career, which she says gives her a different perspective of the game. Smith described her first season as Liberty coach as “fun” and quipped that they kept the “gray hairs to a minimum,” but was optimistic about the future. These words sum up my connection to this game, this honor tonight, and this place I call home. Summer’s heat or winter’s cold, the seasons pass, the years will roll. Time and change will surely show how firm thy friendship. OH-I-O.